Quick! How long would it take to drive the distance to the moon (240,000 miles) if you traveled 10 hours a day at 60 miles per hour? You know you learned this back junior high, but now you only have 10 seconds to figure it out, and you’d better come up with the answer before your partner does. That’s the way of QuizUp, a game that brings Trivia Night from your favorite local bar straight to your mobile phone. It’s been available on iOS since November 2013 and has had massive success there, with about 10 million users. But now Android users can get in on the fun: Plain Vanilla launched QuizUp for Android on Thursday. And this new Android release is nearly identical to its iOS counterpart, save for a few controls that are specific to each platform. I won a bunch of XP during this round and advanced to Level 2 in Web Culture. Woot! The concept is simple: You play a seven-question multiple-choice round of trivia against another player. You have 10 seconds to answer; the quicker you answer each question, the more points you get, with 20 points being the maximum awarded per question. A wrong answer—or no answer—gets you zero points, and the final question is worth double the points. When you finish a round, you earn experience points called XP. You get points for your base match score, earning extra points if you finish the round instead of forfeiting, if you win, and if you answer the final bonus question correctly. Earning XP moves you up to a higher level for that topic, and those levels show how long you’ve been playing QuizUp and how well you dominate in certain trivia topics. When creating your QuizUp account, you can either connect via Facebook, Twitter, or Google+ or just create a fresh account. If you decide to login with a social account, you can see which of your friends are already playing the game. You can challenge your friends directly, or peruse QuizUp’s massive list of trivia topics and pick something to play immediately. You’re then paired with a stranger who also wants to play that category, and the game begins. I had a few concerns about QuizUp’s real time games—namely, how can we prove that we’re playing against a real person when we’re playing against strangers, and how it confirms that we’re actually playing in real time—but Fridriksson explained both. He said that if both player’s internet connection is good, then live play will be really smooth. The question timer is counted from each player’s device, so if you see a delay in answering, yet you both are awarded the same amount of points, it likely has to do with a laggy connection. This timer strategy assures that players are never at a disadvantage for being on a slow connection. As for “ghost players,” those games are extremely rare. If QuizUp can’t find a person for you to play against, you’ll get set up against a demo, which takes the average answer time and responses from all players who have played those questions. Fridriksson said this occurs in less than 5 percent of games, and they do this to avoid isolating players. “If you want to play, you should always get to play,” he said. Questions are multiple choice, and you’d better answer quick! Be aware that if you connect with a social account, your opponent will be able to see your full name and profile picture by default, though you can tweak that in your account settings. You can also turn on Privacy Mode, which means only people you have approved as a friend can see your profile or challenge you to quizzes. 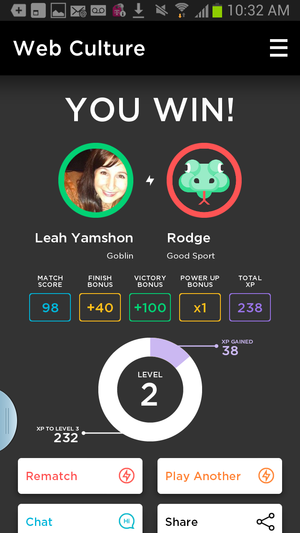 Challenge your friends: QuizUp tries to match you with a real-time opponent, so the two of you can play live. However, if you’d like to play against a friend who is offline at the time, you can challenge them to a round, submit your answers, and wait for them to play the same game later. You don’t ever have to play against a stranger if you don’t want to. Just challenge a friend and wait for them to accept. Playing live adds to the fun: You really feel the pressure to race against the clock to beat them. 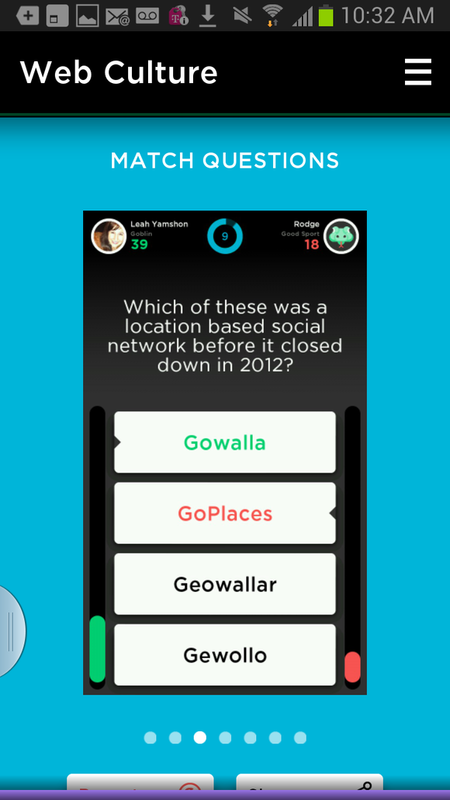 And if you do play against a stranger, QuizUp uses an algorithm to match you with compatible opponents, so no round should ever be too easy or too hard. So. Many. 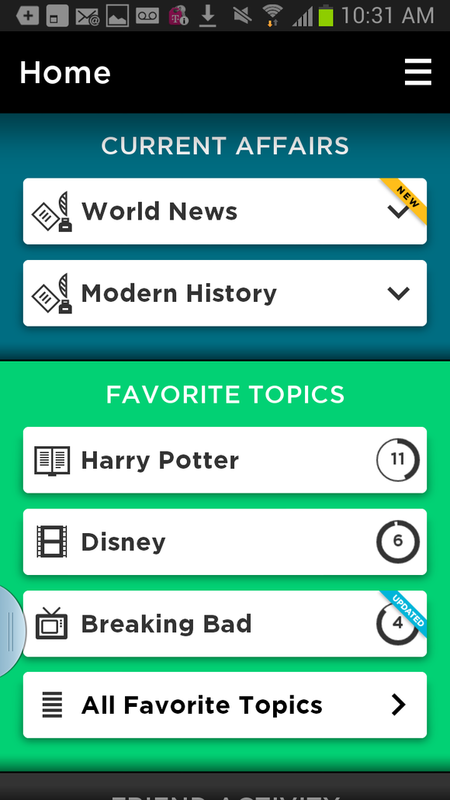 Topics: With more than 400 trivia topics to pick from, there’s bound to be a category for everyone. That’s actually why Fridriksson believes QuizUp has been so popular. ”We have more specific topics than most other trivia games to let people play something that they are passionate about,” he said. From broader topics (General Knowledge) to the oddly specific (trivia questions devoted solely to the movie Mean Girls, which has somewhat of a cult following), QuizUp has questions to pique most people’s interests. If there isn’t something you fancy, let the team know and they’ll consider creating your preferred category—the game frequently gets new topics. Also, once you reach level 15 in a certain category, you can apply to write your own questions for that topic. All questions are vetted by QuizUp’s editorial team, but anyone can submit a ticket if they find an erroneous question or a duplicate within the same round. Earn badges and check your stats: As you play, you unlock Foursquare-esque achievements that show your progress. Badges include category-specific tokens like the Mathemagician (reach level 15 in two topics that include math and magic), location-based acknowledgements like the Atlas (engage with players from all inhabited continents), and skill rewards like the Three-Peat (win three matches in a row). These badges give you an incentive to keep playing and to try new categories. QuizUp also logs info from each of your games to show your overall progress, and you can go back to previous matches to review the questions and learn from your mistakes. I hate to admit how much I love QuizUp. Maybe it’s because I like learning new trivia facts and testing my knowledge. Maybe it’s because I really, really like winning. Sure, any game that involves a social connection raises an eyebrow, but mostly, it’s a hoot. 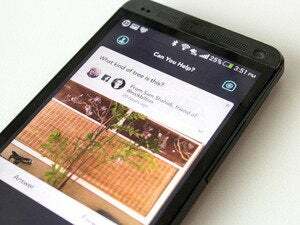 This story, "You Should Play: QuizUp" was originally published by TechHive.